It speeds up your learning process exposing you to hundreds of random equalizations you have to guess. If you are wrong, it will let you know "how wrong", and it will let you hear both your 'guess' and the correct answer. Where does this training method come from? The 'Guess a frequency' Method has been used for over 40 years. There were exercises on cassettes, CD’s or it was done manually by teachers. It works and it has proven its efficiency over the years with thousands of successful engineers. The new 'Correct the Frequency' Method comes from a suggestion Bob Katz (the mastering guru) made. By presenting a piece of recorded music which needs "help" in some frequency range and seeing if the student can not only identify the problem, but also correct for it in a musically satisfying way. So that is what the method is: correct instead of guess. The software is designed to turn these methods into a limitless tool, way better than any cassette or CD, because you can feed it with any music or sound and configure the exercises to a level of diversity and detail which wasn’t imaginable before. 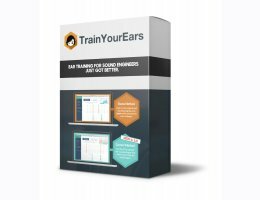 The bottom line on this way of training the ear: IT WORKS! Here is a great video by ProTools Expert explaining how valuable TrainYourEars EQ Edition is to any person recording and mixing music.